Custom Fitted Table Covers & More | Tradeshow Tips | Canvas ETC. Marketing your business at a trade show is no small feat. Luckily, Canvas ETC has you covered! With our custom graphic printing services, we’re able to fashion a custom fitted table cover for all your trade show needs. Making your business stand out over the competition works when you come prepared with your branding materials. Using brochures that discuss your products and services along with showcasing your branding identity with a custom graphic table cover will show consumers what you’re all about. We help you put your best foot forward with our custom made table covers for your trade show needs. Learn more about how this added value service helps your business shine at any event. Marketing your business happens in many forms. One of the most effective forms of showing what your products and services are all about is face-to-face marketing. Face-to-face marketing happens when you’re able to show your buyer in person just exactly what your business is all about. The best place to participate and practice your face-to-face marketing skills is at a trade show. Trade shows have been around for centuries! The earliest forms of trade shows were bazaars held in various areas of Europe. While bazaars were usually marketplaces held outside in the Middle East, they allowed business owners to converse with their consumers in person to attempt to sell their goods and services. The very first large format trade show however, held in England in the mid-1800s, gave proprietors from around the world the ability to market their business to many. As we look through history, we’ll see that while these gatherings weren’t really called trade shows until much later, that’s exactly what they were. People were able to find their favorite purveyors of great products and services while getting to learn more about the local flavor. That value couldn’t manifest in any other way other than face-to-face. With such a great benefit to both business and consumer, it’s no wonder that trade shows for all sorts of different markets exist today. 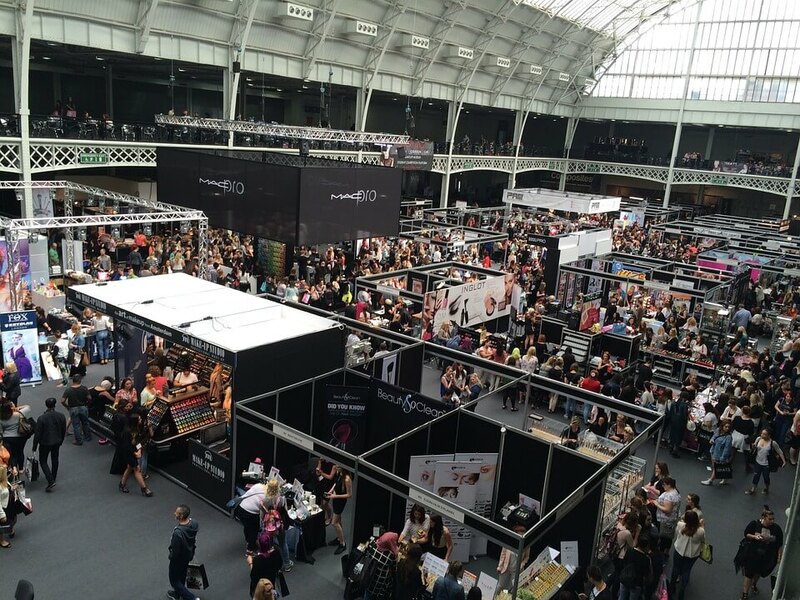 No matter your interest or business, there’s most likely a trade show event available to you. There are all sorts of ways trade show booth setups can garner a crowd. While there are many styles for setups, some more popular options extend themselves to right aesthetic for your clientele. One of the most used options for your trade show booth setup is the modular exhibit. These offer less time spent setting up, as they are portable. Their pop up display function give you the ability to get your booth up and running fast so you can talk to your customer. An interesting style of set up is the island exhibit. These are stand alone exhibits that float anywhere on the trade show floor. The coolest feature of this style of setup is the ability to have full access to your consumers at any angle. If you’re assigned to a corner spot, a well thought of style of set up is the peninsula exhibit. Peninsula exhibits allow for traffic on three sides of your space and either share a wall or have a side that’s closed. It focuses your setup, but still lets your customer get to you with simplicity. The most lavish and stand-out style of setup is the double-deck exhibit. This two-story trade show booth stirs all the right sort of attention to your brand in an eye-catching way! Whatever your chosen style of trade booth, none would compete well without the appropriate supplies for getting the job done. Trade shows go smoothly when you have the right tools. The best way to put the right foot forward is to ensure your business’ brand shines. That way, your consumers know who to go to when they’re looking for the best product or service for their needs. One of the first accessories that you’ll need surrounds just that. A custom fitted table cover for your table at a trade show helps your business show just what you’re about. 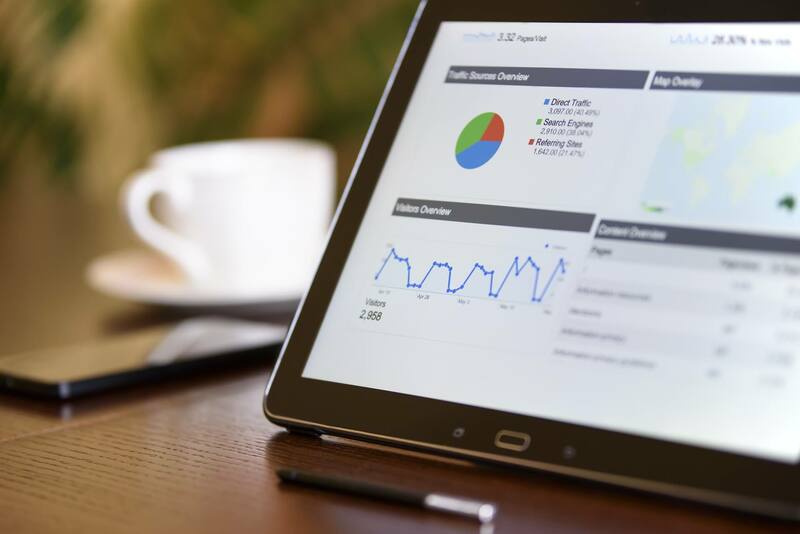 Trade shows are a visual affair, and with the right table cover with your business’ most important information, you’ll stand out against the competition with pride. Custom fitted table coverings aren’t the only must-have accessory for your event. Pipe and Drape kits are essential for trade shows too. These kits will create barriers or accentuate your space by defining its area so your potential new or returning customers will get the best idea about what you’re presenting. Another great unique item like a custom fitted table cover are tension fabric displays. These are also custom made with your brand’s information. This style of display is eye-catching to a crowd. There’s so many different promotional items that are great to have for your upcoming trade show. Stocking up on business cards, brochures, stand up displays, and other promotional items is always a win-win. Your customer will leave knowing your business better and the item they receive will leave a lasting impression. These things and more make great accessories for your trade show event. Having the right items will ensure you’re prepared for your consumers every need. As mentioned, face-to-face marketing works well– especially with the right tools. A custom fitted table cover is the ultimate accessory for a trade show. With customized graphics, your ability to show your business’ most important assets is made easy. What’s more captivating than a custom fitted table cover? You’ll attract the right clientele to your trade show booth with ease when your table covering displays the best about your company. Plain, solid colored table cloths may distract from the ordinary table underneath, but a custom fitted table cover provides information to your customers in an elevated way. With our full coverage printing, your table will be the talk of the show! Don’t limit yourself to just your logo; you can have many different things printed onto this custom table covering. The added incentive of having a great fitted table cover is the option of storage. Hide your trade show storage from the crowd by storing your extra marketing materials under the table. You won’t have to place things in a corner or in your car when you use this table cover. Of all the great marketing tools you’ll bring to your next trade show event, be sure you’re also prepared with a sturdy and one-of-a-kind custom fitted table cover. Thrown: One of the more commonly used coverings, this custom fitted table cover flows over your table beautifully. With custom graphics, your table attracts all sorts of attention with this option. Stretch: This option fits snugly over a table to give a sleek, interesting look. Use your table in a unique way with this stretched offering. Fitted: The fitted option fits your table’s dimensions with ease, making the table appear very professional. Catch the eye of new customers with this great custom fitted table cover choice. What do these styles all have in common? They’re all compliant to trade show standards for fabric flame resistance. When exhibiting at a trade show, it’s important to remain compliant to the trade show guidelines. Keeping the crowd safe helps with the event’s overall success. 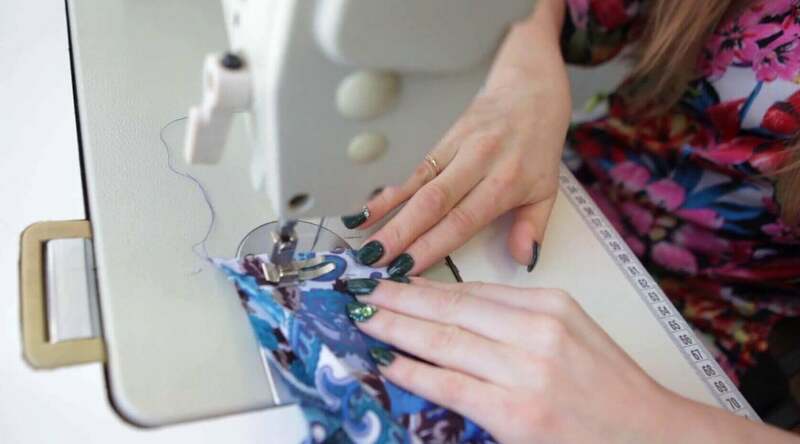 One way of doing so is by following the safety standards for fabric use. 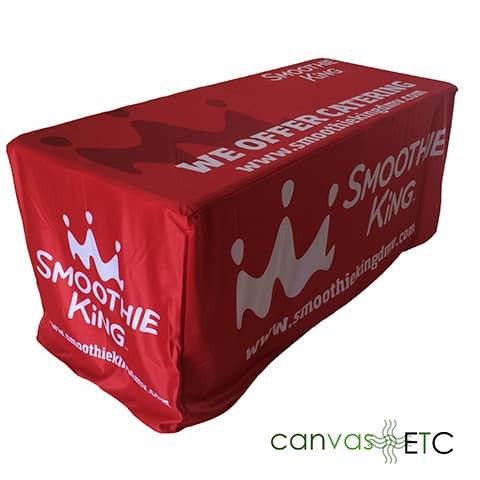 When you purchase a custom fitted table cover from Canvas ETC, each table cover is fire retardant and compliant for trade show use. This means that you can rest easy knowing your materials will not only display beautifully, but be within the rules as well. You don’t have to put your custom table cover away right after a big show. Use it for other events and gatherings to display your company’s best attributes with pride. Canvas ETC is your premier supplier for all things related to your next trade show event, including custom table coverings. Take the guesswork out of having to research all the best places to find your materials. With graphic experts and various options, your table cover is ready in a cinch. Our table coverings are available in different sizes depending on the table you’re using. With all of these wonderful benefits, it’s a no-brainer to purchase your next custom table cover from Canvas ETC. Are you preparing for an event and need many table coverings? Never fear, we offer wholesaling! If you’re an event coordinator looking for excellent, well made custom table covers for your next event, we can help. Contact us today and we’ll keep you covered–literally.